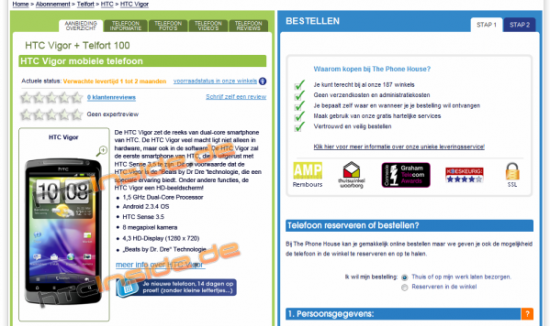 SOURCE: Bild zeigt das HTC Vigor im niederländischen Online Shop von The Phone House | HTCInside - Dein HTC Portal! Hopefully, since I think you can buy it, it means that it'll be released in the U.S Soon!!! No, you cannot buy it yet. It was actually leaked then removed immidiately from the site. Not the look I was expecting, but it's still nice looking. Was hoping it had more of a Thunderbolt look or look like the newly leaked HTC Holiday. now we know why jah called the bio just another device. he did not want to rwpeat the thunderbolts phone after your dream phone debacle. this phone will wipe the floor with the bio in technology and performance. the only hope moto has to recoup their investment in the bio is if the batch of true superphones is significantly late to market or priced at least seventy five dollars higher. for those that dont care about or cant wait for the best, you will probably see the bionic quickly hit the free phone deal mark pretty quickly when one of the real big boys hits the market. Is it just me, or do all these HTC phones look the same? That drum has officially been busted. I love the specs, but the phone is ugly. I still think the SGS2 is the complete package (assuming they don't mess it up with the U.S. versions). I agree. Hopefully the looks change before release. The HTC Sensation is a good lookin phone, they should just use that format. Hopefully it does change. I was hoping for it to look like the HTC Holiday, which is alot better looking. Wow, that Holiday is really nice looking. Yes, let's go with that! !